There are times when the city goes quiet for no apparent reason. Last night was one of those times and it never fails to scare the hell out of me. It was a regular Tuesday evening around rush-hour. The sky was that shade of sapphire blue that only lasts a few minutes between sunset and sundown. The air was not too cold, but just chilly enough for a jacket: perfect walking weather. Ahh, what a lovely evening. But why is it so quiet?! Where is everyone? Where are all the cars?? The entrance to the Holland Tunnel, normally clogged with honking cars and buses, is empty. The lone traffic cop stands in the middle of the intersection with his hands flapping at his sides. Does he know something I don't? I head along my usual route and nothing seems to be out of order - the shops are open and a few people wander the streets, but there is an unignorable absence of sound that increases my panic with every block. I get to Houston Street - normally 5 lanes of revving engines - and it's so dead, tumbleweeds could actually take root in the middle of the road. WTF?! I look around me and the few people out walking are oblivious to my frantic state. If something was happening, they would be panicked, too, right? There's a guy on his phone and he's talking about nothing. If there were something amiss, he would most certainly be screaming into his phone. Right? I reach Broadway and almost laugh because there is - you guessed it - absolutely no traffic. None. Did Bloomberg pedestrianize all of downtown and not send me the memo? Ok, ok, I'm just driving myself crazy now. Crazy because I'm not hearing/seeing traffic. Anyone in their right mind would be celebrating this moment, not having a fit over it. With a few deep breaths, I relax and start to enjoy this mile-long walk on a beautiful pre-spring evening. The air smells fresh, I pick up my step and, then, suddenly, from every direction, comes the blaring mwah mwah mwah of fire engines. Many fire engines. Oh. My. God. Fire engines! As if I'd never heard fire engines before, my heart skips a beat. 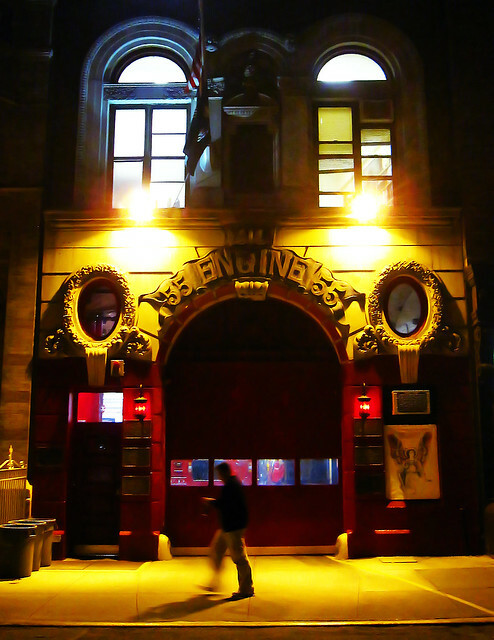 One engine flies north, another west, followed by another FDNY vehicle with flashing red lights and they pass right by the fire house on Great Jones Street, sirens wailing so loud, I can't hear my own footsteps. More fire engines race down 4th Street and up Bowery. Are they headed to my house? Omigod, they must be going TO MY HOUSE! Ha! My ex, a NYer born and bred, would get this panic when she would visit me in Canada and we'd walk off the main drag and it would suddenly turn quiet. Very quiet, with no one around. Peaceful to me, but she thought it was unnatural, even dangerous . . . well, you is what you're used to. @COS - That's so funny your ex had the same reaction. I grew up in a rural area and, when the noises of the forest suddenly stopped, that's when we knew to be scared. This was a great post and I love the black and white photo at the top. I too get really spooked when no one's around and it's quiet here. Alway's a Twilight Zone type of feeling. I like this story. It really is spooky scary when it is too quiet and no one is around especially in the East Village or anywhere in NYC for that matter.